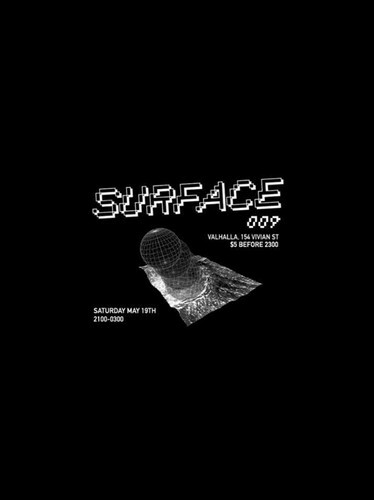 Surface sets out on another journey to the depths of dance music and live performance art. Lifting off from our favourite launch pad, Valhalla, Deejays: Bala, Benefit, DJ Palmer, DJ One Outs, Samuel Forbes and Son of Sesh navigate the dance while Tomollusk and M!ke go head to head in a battle style live art paint off. Veejays Cubeman and HI-Dez will have all their visual and sensory pleasure toys set up as well so prepare for UV Bubbles, Snow, Bright Lights, Lasers, Smoke, Mirrors and Exotic Dance Moves. Entrance: $5 cash only before 11pm. $10 cash only after 11pm. Valhalla has a limited capacity and as our events continue to gain popularity we will enforce more strict regulations on intoxication and behaviour. If you want to dance, get down, socialise and interpret art work we would love to have you at our party, get in quick. If you aren't interested in these activities please refrain from attending. We encourage you to sport UV reactive clothing and other rave attire if possible. Do up your dancing shoes extra tight, we gon get down.